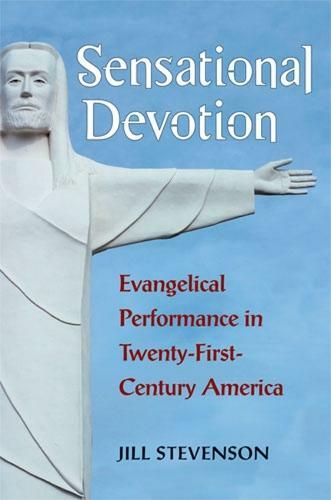 In Sensational Devotion, Jill Stevenson examines a range of evangelical performances, including contemporary Passion plays, biblical theme parks, Holy Land re-creations, creationist museums, and megachurches, to understand how they serve their evangelical audiences while shaping larger cultural and national dialogues. Such performative media support specific theologies and core beliefs by creating sensual, live experiences for believers, but the accessible, familiar forms they take and the pop culture motifs they employ also attract nonbelievers willing to "try out" these genres, even if only for curiosity's sake. This familiarity not only helps these performances achieve their goals, but it also enables them to contribute to public dialogue about the role of religious faith in America. Stevenson shows how these genres are significant and influential cultural products that utilise sophisticated tactics in order to reach large audiences comprised of firm believers, extreme sceptics, and those in between. Using historical research coupled with personal visits to these various venues, the author not only critically examines these spaces and events within their specific religious, cultural, and national contexts, but also places them within a longer devotional tradition in order to suggest how they cultivate religious belief by generating vivid, sensual, affectively oriented, and individualised experiences. "Jill Stevenson's compelling analysis, Sensational Devotion, argues convincingly that evangelical performance is instead a complex articulation of belief that is shaping a larger conversation about the role of religious faith in America. ... This is a lively and engaging work of scholarship that is a pleasure to read." "[Stevenson] offeres a fascinating, challenging, and necessary survey of how evangelical Christianity performs itself and its theologies in a variety of locales and formats. ... The volume is eminently readable, and Stevenson's style is accessible but still scholarly. This book will be valuable in a variety of disciplines."